Vegan jalapeño cornbread, y’all! This isn’t your mama’s recipe. No ma’am. This is a dressed up and sassy version of traditional and demure. I like this hot little number so much better than the not hot versions I’ve had in the past, because I’ve never been one to shy away from a little heat. But, for those of you who fear the spice, fear not, this jalapeño cornbread only has a little warmth to it. It’s not a kick in the mouth kind of spicy, it’s subtle, yet still exciting. 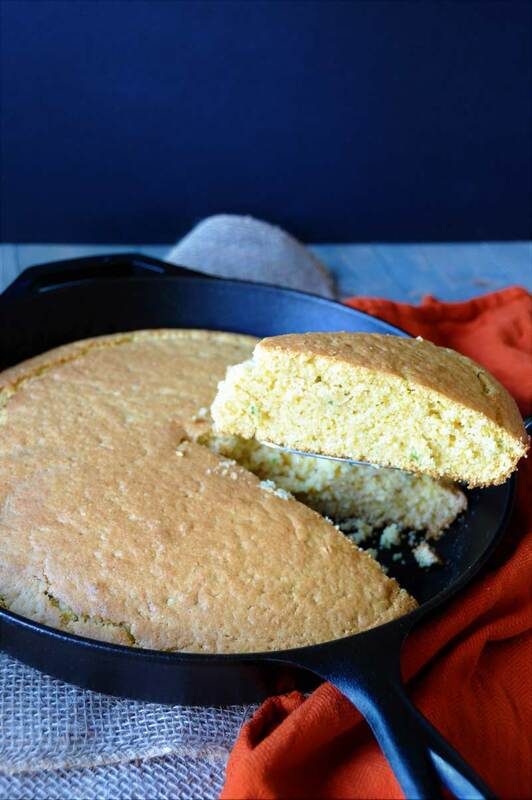 Whether you like spicy, or not, you’re going to love this cornbread recipe. 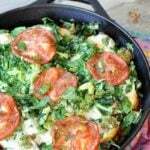 You’ll find a little sweet, a little heat, and a little savory in this skillet of yum. You’re also going to LOVE how spongy this bread is. It’s not dry and sandy like some cornbread recipes I’ve had. This has a good crumb and it melts in your mouth. So what makes this spicy jalapeño cornbread’s texture not dry? I think it’s the aquafaba that I used for the egg replacer. Aquafaba, otherwise known as the liquid in canned chickpeas, is a magical ingredient. I’ve been using it in all of my baked goods lately and I’m blown away by the difference in the texture of my cakes and breads. You need to try it! 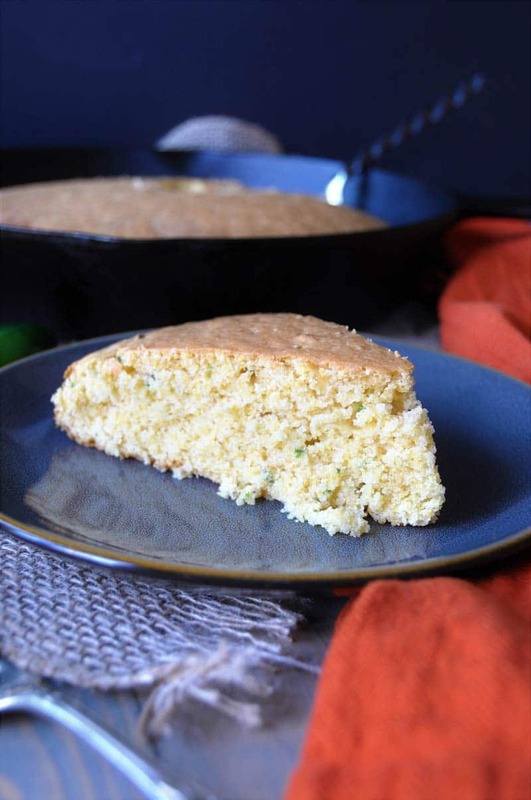 Can we also talk about the flavors in this sweet and spicy jalapeño cornbread? They’re all that and then some! I added coconut sugar and maple syrup to the batter and they lend a light sugary taste that compliments the heat from the tiny pieces of pepper you’ll get in every bite. I took a pan of this to a party on Saturday and it sat next to a non-vegan batch of cornbread. Several people quietly (so as not to offend the person who made the other cornbread recipe) told me that they loved my recipe. They thought that the texture and density were wonderful, and that the tiny kick of spice was the perfect balance to the sweetness of the cornbread. I also brought a batch of chili and chocolate chip cookies, and the million dollar question asked by everyone was, “These are vegan? !” I love it when that happens. You need to whip up a batch of this easy jalapeño cornbread. It’s a one bowl recipe, and you only need nine ingredients. If you absolutely can’t handle spicy, leave the pepper out. It will still taste amazing. As always, once you’ve made it come back and let me know what you thought, and share a picture on my social media pages. I love seeing your creations. Slightly sweet and spicy vegan cornbread that melts in your mouth! Perfect with chili. In a large mixing bowl whisk together the dry ingredients. Stir in the wet ingredients and the minced jalapeño until just combined. Pour the batter into the skillet or cake pan and make sure that it’s evenly distributed. Bake for 25 minutes or until a wooden toothpick comes out clean when inserted in the center of the cornbread. The crust should be a nice golden brown and there should be a few cracks on top. 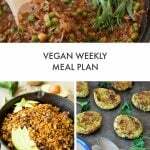 « What This Vegan Ate to Train for a Marathon, and Other Things…. This sounds like such a delicious, feel-good-food sort of recipe. I swear I can taste it already just from your beautiful description & piccies. Hi Trish! Great minds think alike! :) I keep it in a sterile container for up to three days in the refrigerator. If I'm not going to use it before the third day I freeze it, just to be safe. I can't wait to hear what you and your family think of the cornbread. There it is! It sure will add some extra cushion and warmth to a nice bowl of hearty stew or chili! Oh, this totally reminds me that I made a Cranberry Jalapeño Cornbread last year and never got around to posting it. I need to remake it because it was so good! Just like I'm sure this version is! Love the little bits of heat from the peppers, but I do like my cornbread on the sweet side, just as you made it here. Yummy!! I use aquafaba all the time in quick breads, but I've never tried it in cornbread. Good to see that it works here too! 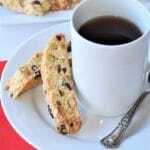 Ooohhh, cranberry jalapeno cornbread sounds amazing! Hurry up and post that recipe, Jenn! Yep, aquafaba is the BOMB! I love it in almost everything I bake. Oh yum! 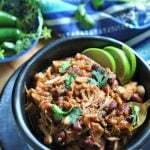 Perfect for pairing with chili all fall and winter long! It's so perfect with chili! Mmmmmmm this looks good! I've never made cornbread but this is making me want to. I LOVE jalapeño!!! I'm drooling over here lady. Just pass me that entire thing! This looks great! It seems like all the cornbread recipes I see contain dairy. Thanks for making yours vegan! Thank you, Amy! Making it vegan was easy, and my family likes this version better than the non-vegan that I used to make. Perfect with my chili! I adore cornbread and love the jalapeño addition. I can't get enough spicy food! Thank you, Melanie! We are two of a kind when it comes to loving the spice! 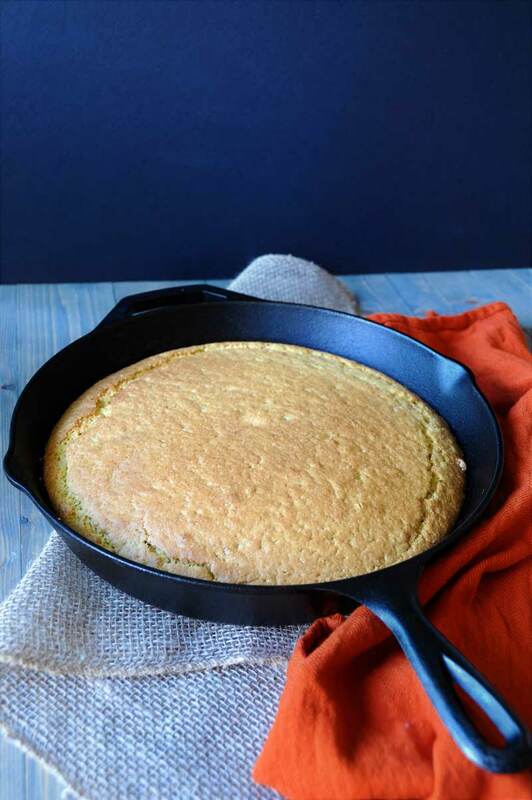 Skillet cornbread is the best, isn't it? Perfect for fall and winter dinners! I love that you've used aquafaba. I bet this is perfect with chili! This recipe sounds delicious! And that jalapeno in it! Love the use of aquafaba! This looks perfect and hubby was just looking for a spicy cornbread recipe to go with chili - thanks! 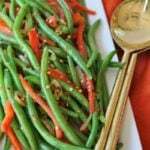 As long as the jalapeno pepper is actually hot, I've been experiencing some that taste like a bell pepper lately, he'll like this recipe. Thanks, Christine! I make my cornbread in the skillet too and it's the best. So much better than just a pan! I like jalapeno cornbread but so many tend to be too spicy, that it's hard to enjoy. I like that yours doesn't have huge chunks in it and some sweetness to balance it out. Yum!! I swear that your Southern roots and my mom's influence on my cooking are so similar. Love it! :) I've found that you have to test the jalapeno before adding it to food. Some taste like fire and others like a bell pepper. It frustrates me when I buy the latter, because I love spicy. Just wanted to give you an update as I made this last night - FABULOUS!!!!!!! Had this with chili, vegan of course, and this cornbread really topped off a perfect meal. Go-to cornbread from now on! Japaleno did not make this too spicy at all if you're worried of heat. Perfect. Thank you so much, Trish! I'm so happy you liked it. One jalapeno really shouldn't make it too spicy because it's a big batch, but I always give the pepper a test before adding it. Some taste like fire and others like a bell pepper-haha! 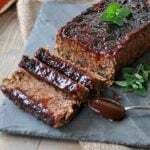 Can I substitute coconut sugar with Turbinado or Demerara sugar? Hi! Yes, that should be fine. If there's flour, it's not gluten free.